Pat Kutzner, the founder of World Hunger Education Service and of Hunger Notes, passed away December 8 in Albuquerque, New Mexico after a short illness. Navajo Chapter in New Mexico. She helped initiate various projects, including establishing a local thrift store and an annual festival, the Eastern Navajo Arts and Crafts Festival. She also helped raise funds for various projects including an erosion control and water conservation project carried out by Navajo youth. She remained working for the Chapter until a few months before her death. A chronology of Pat’s involvement with hunger issues and WHES appears below, showing the energy and scope of her involvement in addressing the causes of hunger. It is drawn from a document Pat provided me in 2010 when I requested information about WHES’s history from her. Also see the comments on Pat’s work of Antonio Gayoso, current WHES Board member, Jim Levinson, then Director of the International Food and Nutrition Center at Tufts University, Patricia Young, now deceased, then Executive Director of the U.S. Committee for World Food Day, Ambassador Tony Hall and others, made in 1999 as part of a special issue of Hunger Notes on development education, which was dedicated to her. Pat founded WHES 40 years ago next year. The WHES Board was hoping to have her back to Washington DC for a celebration of the 40th anniversary, and a look at the future of efforts against hunger and WHES’ role in the coming decade. The WHES Board has established a fund in her memory that will be used to further her multifaceted approach to hunger issues, particularly reducing hunger through knowledge. We hope you will join us in this effort. Contributions can be made through the PayPal link at the top of the home page, or by check to WHES at PO Box 29015, Washington, DC 20017. In 1975, Pat moves to Washington, D.C. to be closer to the actlon on policy issues affecting hunger as Bread for the World and the Interreligious Taskforce on Hunger began their advocacy. In May 1975, the Episcopal Office of Christian Education requests a monthly newsletter to keep the newly formed Episcopal Hunger Network updated on relevant resources and events. Pat composes the first issue of “Hunger Workshop Notes” in June 1975 on an old Smith·Corona portable typewriter while sitting on the floor of the non-air-conditioned room she is renting temporarily at Trinity College near Catholic University. Pat (a Quaker) is also asked to be the Episcopal Hunger Network’s liaison on the Interreligious Taskforce on U.S. Food Policy until an official Episcopal representative can be named. By early 1976, with encouragement coming from several directions, Pat recognized the potential value of an information clearinghouse and networking center especially for local, regional, and national leaders but also for any citizen or organization seeking to eliminate hunger and poverty through policy advocacy, education, communication, or dlrect action. Through its publications, seminars, consultations, and resource center the organization would disseminate information about the extent and causes of hunger and facilitate communication and cooperative action among those working for solutions. Finally, in all that it did, this organization would promote a multifaceted understanding that included ethical, religious, social, economic, political and scientific perspectives on the problem of food insecurity anywhere. Only by seriously attempting to understand the full context of the hunger problem in all of its complexity, Pat believed, could we wisely and effectively respond. This, in a nutshell, was the vision that World Hunger Education Service would try to fulfill. But first, she needed a rent-free “office” where she could set up a “desk” (i.e., a card table with a Smith Corona typewriter on it), keep files, have a “business address” and use a telephone. It happened, thanks to Sam and Miriam Levering, in a corner of their third floor office in the Friends Committee on National Legislation building on Capitol Hill, where they were working on the Law of the Seas Treaty; the “rent” meant answering their telephone and taking messages when they weren’t there to do it themselves. Then, with that need settled, Pat found out how to register and incorporate (sans lawyer) a non-profit organization in the District of Columbia, and invited Barbara Howell, Bread for the World’s domestic hunger specialist, and Bob Cory, director of William Penn House, the Quaker Center on Capitol Hill, to be her co-founders of World Hunger Education Service. Both agreed wholeheartedly, and WHES was incorporated in Aprll 1976. IRS 501(c)(3) status followed a few months later. With its bylaws completed, a larger board of directors, and Pat as executive director, WHES begins in July 1976 offering Hunger Notes (new title) to the wider public by subscription, while continuing to provide it under contract with the Episcopal Church Center in New York City for special distribution to the Episcopal Hunger Network. Fifth Edition (1992) co-published with Bread for the World Institute, with additional support from 30 other private sector organizations and individuals. Also in 1976, the Congregational Church (United Church of Christ) in Arlington, VIrginia, asked World Hunger Education Service for help in developing an educational program about hunger that could be used with children ln grades 3-4, 5-6, and 7-8. By 1978 this effort had evolved into a curriculum guide co-edited by Patricia L. Kutzner and Linda Stoerkel titled Have You Ever Been Hungry?, published by United Church Press for use also in 10 additional Protestant denominations. The Politics of Hunger Seminar/Praxis, begins in 1977, funded by grants from several major denominational hunger programs. This was a two-week program for up to ten people at a time who were leading (or planning to head) hunger action in their own communities or institutions. Some were academics, some were sent by their churches, some were returning Peace Corps volunteers … a very interesting mixture each time. The semlnar/praxis was offered two or three times a year starting in 1977 and ending in 1980. Difficulty finding affordable lodging In D.C. for the participants was a major reason for discontinuing the program in 1980. The moming sessions usually focused on discussions with invited “experts” from relevant NGOs, UN agencies with offices in Washington DC, federal agencies, and notable programs operating on hunger and poverty in D.C. itself. These discussions were totally “off the record,” unrecorded, unpublicized and informal. The speakers could “let their hair down” and talk freely of their own experience, frustrations, and occasional successes in accomplishing a beneficial change. Again and again, the speakers told Pat later how wonderful it felt to be able to talk so openly about such things face to face with other concerned people without worrying about unwanted consequences of being so frank. And how good it felt to be with supportive citizens who appreciated what the speakers were trying to do and the difficulties they faced in that effort. And vice versa: WHES staff and participants alike were often surprised and very glad to discover some really good people working behind the scenes in government and elsewhere, trying very hard to “make a difference” against great odds. The Greater Washington Area Food Bank initiated by former WHES intern Rick Stack, who got the inspiration from a Seminar/Praxis. The Philadelphia Area Food Bank: similarly initiated by an Episcopal churchwoman upon returning home from a Politics of Hunger Seminar/Praxis. When Ronald Reagan succeeded Jimmie Carter as president, the War on Poverty officially ended and a frequent government speaker at the Seminar/Praxis was ordered to shred his files containing the story of the War on Poverty’s interaction with countless communities and organizations across the U.S. In desperation he asked WHES to store the files until a better and more permanent home could be found for them. Then with his own car and mover’s dolly, he hauled those files over in load after load, box after box, stacked from floor to ceiling in WHES’s seminar room. Happy ending: all of those War on Poverty records are now preserved for posterity (and future research) in the Lyndon B. Johnson Presidential Library at the University of Texas in Austin. In 1980, the Office of Women in Development In the U.S. Agency for International Development sends Pat to the Mid-Decade for Women Conference in Copenhagen as part of her research for a working paper on “Communicating on the Needs of Rural Women.” When the Carter Administration ends and the Reagan Administration begins, USAID loses interest in this topic and the working paper is never submitted. In 1985, the Friends (Quaker) World Committee for Consultation appoints Pat to its international delegation of observers at the Nairobi conference ending the UN Decade for Women. “Women Farmers of Kenya” becomes the April-May issue of Hunger Notes In 1986, after Pat recovers from a major operation for the cancer discovered after a long search for the cause of persistent but ambiguous symptoms that first appeared in Nairobi. 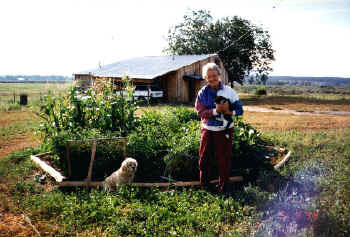 In 1989 Pat agrees to write a “reference handbook” on world hunger as part of a series on “Contemporary World Issues” published by ABC-CLIO in Santa Barbara, California and Oxford, England. Board member Phillip Hesser agrees to take on the editorial responsibility for Hunger Notes during most of 1990. The book Is published in 1991. In 1995 Pat begins to feel that it is time to retire from WHES after 20 years. Then, while vacationing in New Mexico, a chance meeting with leaders of a remote Navajo community near Chaco Canyon ends with their only slightly veiled invitation to think about returning as their planning consultant. The whole idea seems both exciting and preposterous, but when she returns to Washington, she notifies the board of directors of her intention to retire In April 1996, the twentieth anniversary of WHES’ founding. She also convenes a gathering of board members and other friends of the organization to consider whether and how Hunger Notes should continue after her retirement. Lane Vanderslice volunteers to become the new editor of Hunger Notes if the board approves, which it gladly does. A period of transition begins. By April 1996 the transition is complete, Lane Vanderslice is fully responsible for Hunger Notes, and Pat leaves WHES. In October 1996, with official Quaker support, she accepts Torreon/Star Lake Navajo Chapter’s invitation and returns to New Mexico to be their planning consultant for six months starting in October. She remained working with the Chapter until a few months before her death.